I missed the initial downside break of the symmetrical triangle pattern on the pair’s 1-hour forex time frame so I opted to enter on a pullback to the broken support around .8650. I set my stop safely above the triangle resistance at .8750 then I zoomed out to the 4-hour chart to spot a potential target. Lo and behold, I noticed that the pair seems to be on track towards the longer-term support at the .8400 major psychological level. While I’ve got my eyes set on this area as my ultimate PT, I’ll be trailing my stop once price reaches the area of interest around .8500. I’m bearish on the Kiwi mostly due to dovish RBNZ rhetoric and the never-ending slump in New Zealand’s dairy industry. Earlier today, the GDT auction posted a 7.9% decline in prices, marking its third consecutive bi-weekly drop. 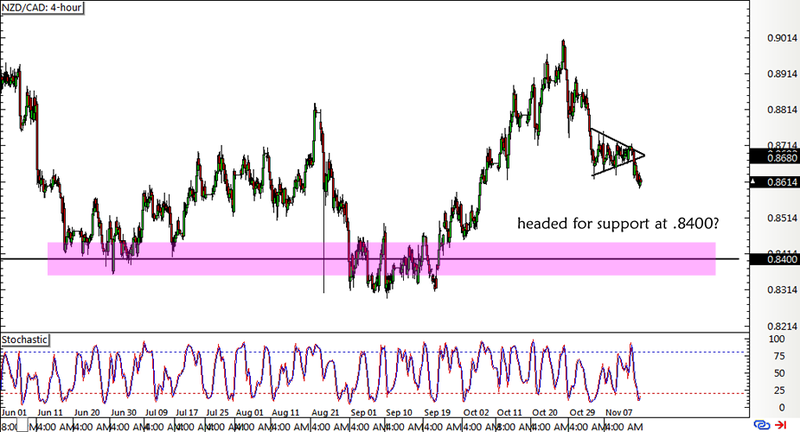 I’ve already had an NZD/JPY short trade prior to this but I decided to close that one early because of the recession in Japan and the upcoming BOJ statement. On the other hand, I’m mildly bullish on the Loonie thanks to the recent pickup in oil prices. As it turns out, the ongoing airstrikes in Syria are taking place near oil fields, potentially limiting production and supply, thereby putting upward pressure on prices. 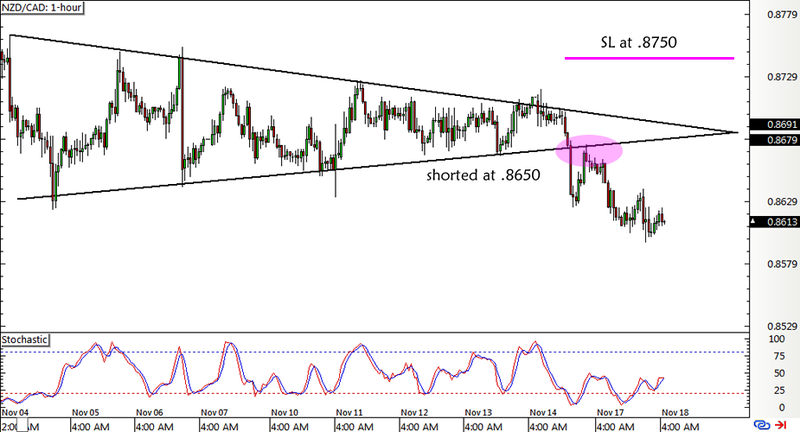 Short NZD/CAD at .8650, stop loss at .8750, profit target at .8400. I’ll be moving my stop to entry and trailing it from there once price hits the .8550 mark. I’ve risked 0.5% of my account on this short-term forex setup and if you’re thinking of joining me, don’t forget to check out our risk disclosure first.